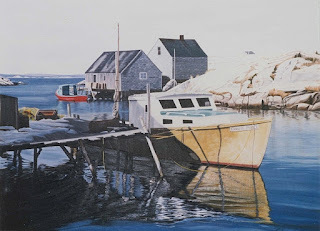 Phil Chadwick's Art: #0066 "The Granite Prince, Peggy's Cove, Nova Scotia"
#0066 "The Granite Prince, Peggy's Cove, Nova Scotia"
From the spring of 1978... and my days at CFB Shearwater. My favourite boat "The Granite Prince" in Peggy's Cove before it got radar. It was a beautiful day in the spring of 1978. There was no advection fog which was a treat. We were out for a drive and a meal at the Sou'Wester Restaurant in the BC Era - Before Children. I painted exactly what I saw. This would have been painted in the apartment in the Wood Lawn Mall area of Dartmouth.